Soaked in decadence and hand-painted detailing, Birmingham's new Indian restaurant and cocktail bar has been three years in the making - so could this be Birmingham's most glamorous restaurant? Despite a small doorway at the Five Ways end of Broad Street, Varanasi belies the huge subterranean restaurant within. It's dubbed Birmingham's biggest restaurant as it is large enough for 500 covers in the belly of this cavernous building. 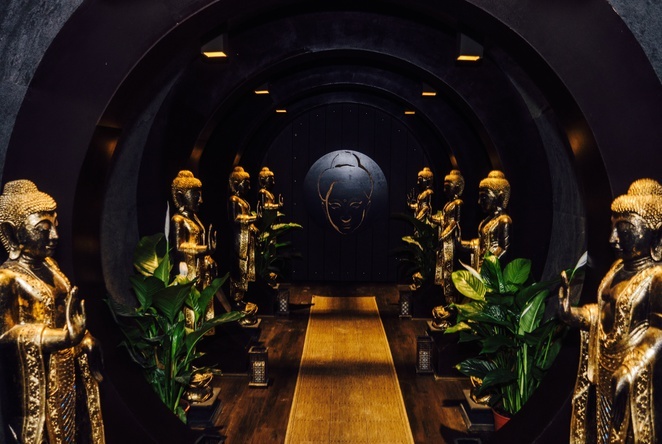 It feels like a scene out of an Indiana Jones film as the hostess leads you into a small tunnel lined with golden Buddha statues. At the end is a heavy wooden carved door that unlocks to reveal glistening treasures inside. This is the top floor cocktail bar shimmering from candles and mini Buddhas, but this restaurant is named after the ancient northern Indian city regarded as the spiritual capital of India. 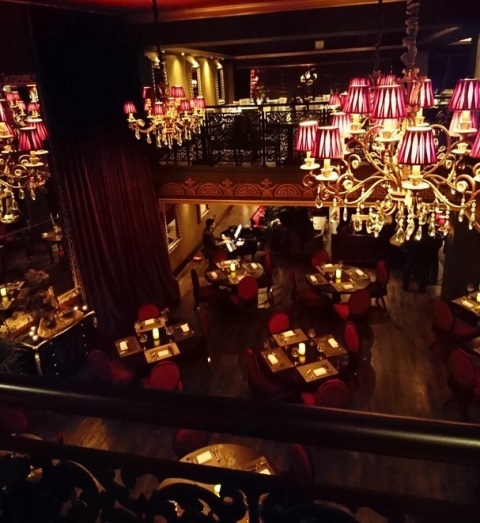 A staircase winds down to a second floor bar where discreet private dining rooms for between 10 and 20 people are hidden in beautifully decorated alcoves featuring hand-painted ceilings and touches of gold leaf. No expense has been spared in making these Arabian looking spaces feel welcoming. Peeking over the balcony to the floor below, you get your first glimpse of the underground restaurant, a huge ballroom type affair soaked in red velvet and lush golden accessories, all beneath bejewelled chandeliers. Varanasi wants guests to be startled with this "wow factor" and staff aren't shy in explaining that the restaurant is pitching itself as the place to go for big celebrations, special occasions and those romantic moments when you want to impress. The big question is whether the food at Varanasi matches it's decadent surroundings? It's fine food, excellently spiced and cooked, with a flourish of extravagance and attention to detail. It's not surprising as the menu has been curated by Michelin-star chef Alfred Prasad. Food is beautifully presented, like the delicious potato cake starter with spiced chickpeas (£6) and yoghurt that comes with an edible flower perched on top. It's not just about the appearance as it's a well-balanced dish taste-wise too. Beautifully presented potato cake starter at Varanasi in Birmingham. We also tried the Raunaq-e-Seekh kebabs made with slow-cooked aromatic minced lamb that had been infused with herbs & spices (£10). The smell alone was mouth-watering, the taste was even better. There's plenty of choice in the very full menu - eight meat options and seven vegetarian alone just for the starters that ranges from tandoori tiger prawns (£12) and dil salmon tikka (£11) to Kashmiri smoked tandoor grilled lamb cutlets (£12). There's even more choice for the main course. The meat dishes, priced between £18 and £21, include authentic curries from various Indian regions using Karahi, chetti or scented spices. The murgh masala had succulent chicken pieces in a memorable, intricately spiced curry sauce, while there are a good choice of fish based dishes. 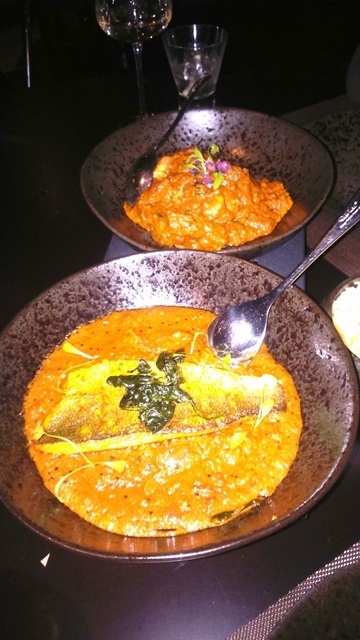 We plumped for the malabar fish curry that had a healthy piece of well cooked seabass above a bed of spinach and tangy but heartening curry sauce. 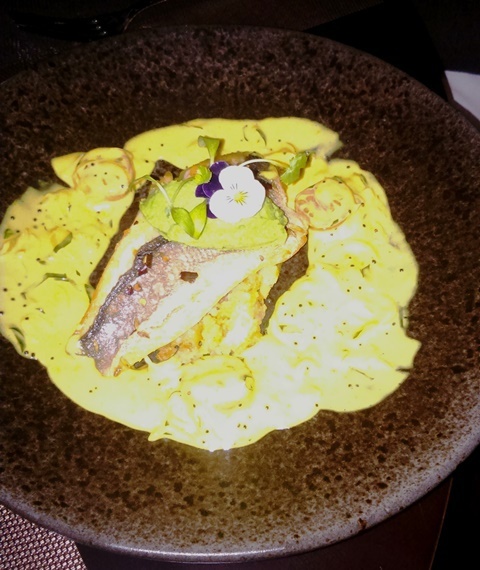 We also got the chance to try a new addition to the menu - seabass moily curry - that was a more western adapted dish that cater for diners wanting something mellower and milder than a curry. A haunch of seabass sits on spiced potatoes amid a creamy delicately spiced sauce. There were also some crushed peas but it really didn't need that on the plate. Vegetarians will be happy with the menu too as there is a wealth of main dishes priced from £7 to £9 including regular favourites like saag aloo (spinach and potato curry) and tadka dal (yellow lentil curry). There are also exotic delicacies like baigan mirchi ka saalan, a dish originally from Hyderabad, involving baby aubergine and green chillies in a smooth sauce. The usual accompaniments like naan bread (various types at £4 each) and rices (£3 to £4) are all there but it's the raita – a cooling yoghurt based curry accompaniment – which comes with a difference. Along with the usual mint and cucumber flavour, there's also an option of a cucumber and pomegranate, which has more texture with the crunchy, fruity pips. They are priced at £3 each. In contrast to the rest of the menu, there are only three choices for dessert. The main dish is the Crown of Varanasi (£7), a warm carrot based Asian dessert that is a well made sticky and sweet concoction. 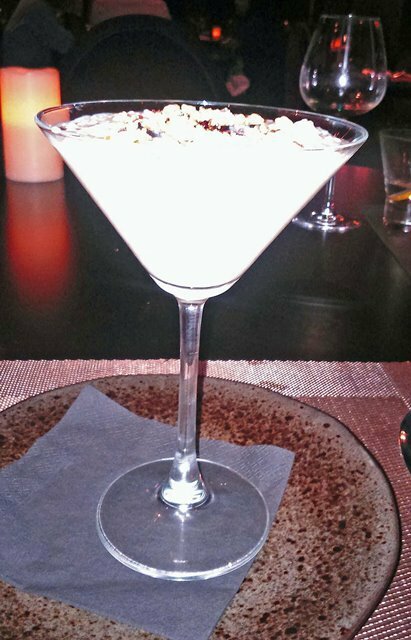 Other than that, it's a choice between the lavender & berry kheer (£5) - an Asian pudding and a cold rice pudding of sorts - that is served in a cocktail glass, or a fennel and anise infused caramelized apple with crushed meringue (£6). The elaborate sense of occasion is never far away and to close the meal, a waitress fills heated water bowls with perfumed oil and then drops in a small tablet that expands into a scented hand towel. It's another wow factor moment that is a nice extra touch. Despite the authentic, delicious Indian food, Varanasi doesn't want to be confused with a typical Birmingham curry house - it's priced itself way too high for the quick balti and a naan on a Friday night bracket, but that is because it has gone for a higher quality of food, elegance and presentation. For those with money to burn, there's even the Midlands most expensive cocktail available here - The Jewel of Varanasi. For a cool £500, it comes in a crystal brandy balloon and is made with Hennesey Paradis, Grand Marnier, vanilla pods, quails egg, lemongrass syrup, black truffle shavings and 24 carat gold leaf. Some of the prices are the only drawback to this restaurant, as the super cocktail aside, the pricing of the meat starters are a little high at around £12 each when you can get a main meal curry for £18. It could also do with a few more dessert options. That said, Varanasi is distinctive Indian fine dining in glorious surroundings. It aimed to be the place to go as a celebratory venue that impresses with its finery and food, and it really does achieve that.